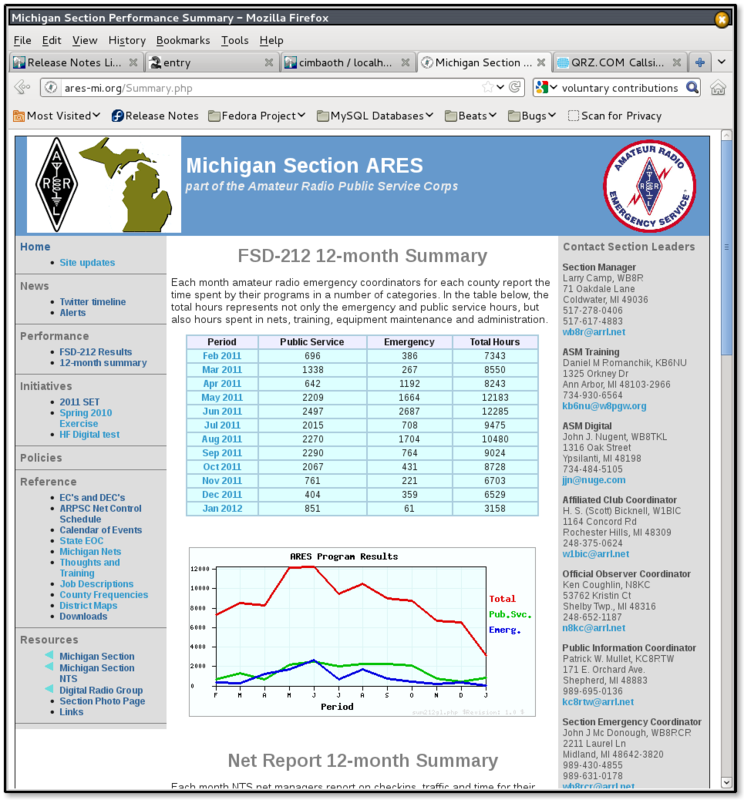 Michigan ARES programs reported 105,106 hours in 2011, over 24,000 of them occuring in May and June. 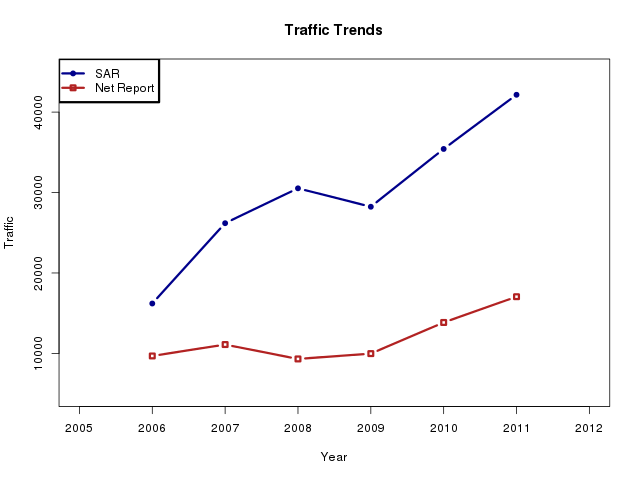 PSHR reporting for 2011 has been relatively flat across the year. The summer months tend to be higher due to bad weather and various public service events. Stations handling traffic are encouraged to submit Station Activity Reports (SAR) indicating the amount of traffic handled. 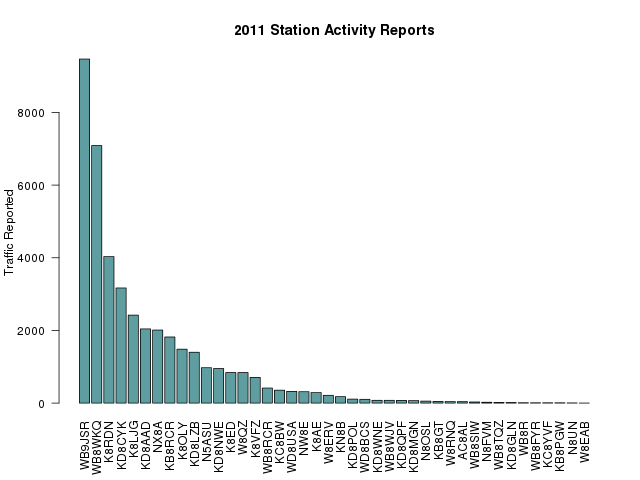 42 stations reported during 2011, up from 31 in 2010. Since most of the traffic is handled by relatively few stations, and those stations tend to be the stations that report, the traffic totals reported are quite high. Stations handling a lot of traffic tend to be those stations that act as liaisons to Region or Area nets, so even though the number of stations reporting is quite small, the amount of traffic reported is considerably larger than the totals from net reports, which include only messages passed on Michigan nets. 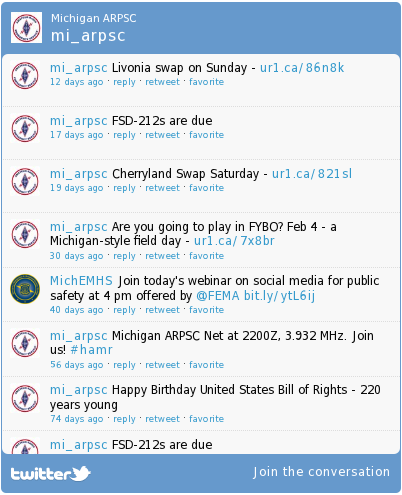 For 2011, Michigan stations individually reported 42,157 messages. 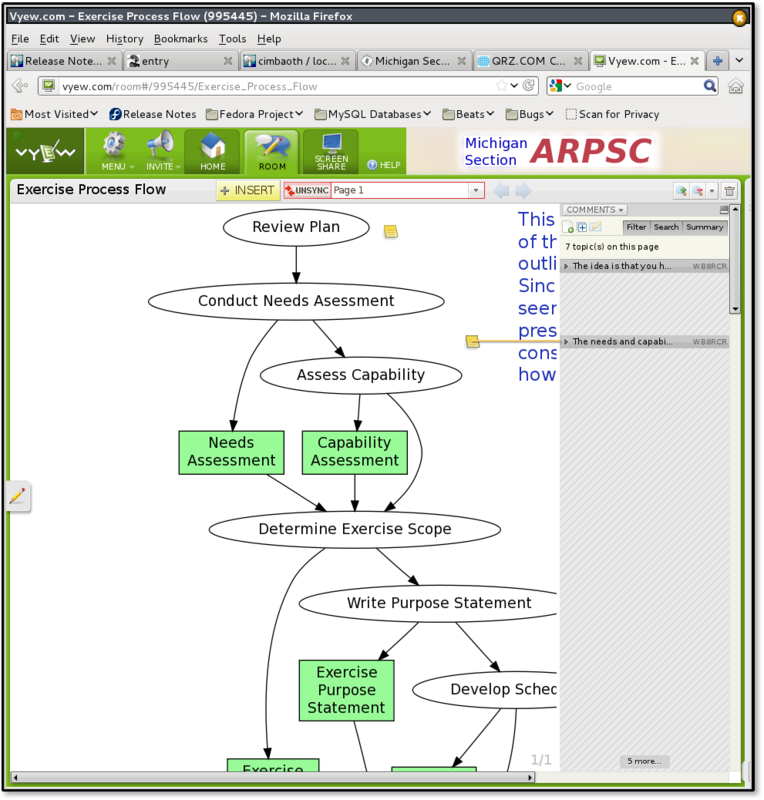 The Section has continued to work on the ARES/NTS interface and held two drills in 2011 to develop that skill. A Section-wide exercise was held in conjunction with the State's New Madrid Aftermath exercise, and the annual SET was also used to develop that skill. In addition, also in conjunction with NMA, A drill was held with the State of Indiana to exercise sending a specific form between state EOCs. Only a relatively few stations participated in that drill, which also involved Michigan Army MARS and Indiana Navy MARS. 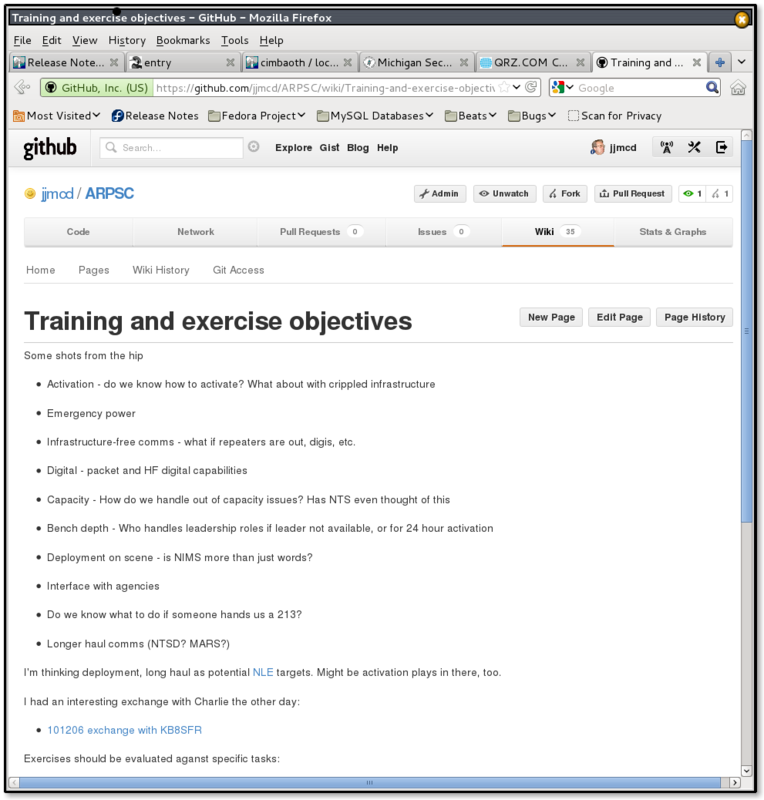 One objective for 2011 was to make better use of FEMA's HSEEP for exercises. The Indiana drill moved us quite far in that direction, and the October SET followed the FEMA procedures quite closely. Rationale: The 2011 SET led to a well considered improvement plan. A year later it would be good to get a checkpoint on progress on that improvement plan. 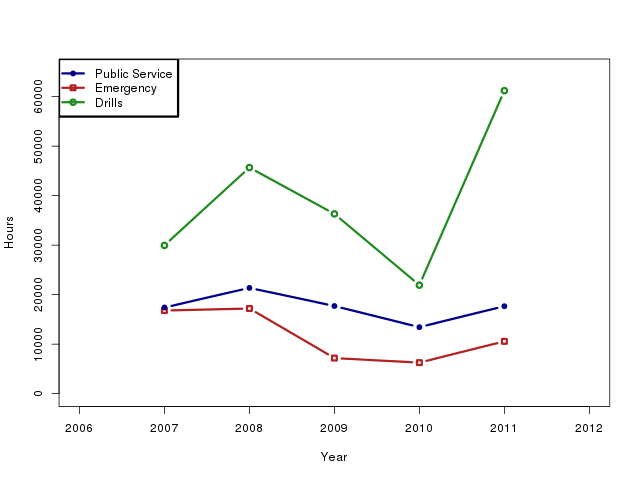 The spike in Drills for 2011 should not be a surprise. Both the New Madrid Aftermath exercise and the SET involved more effort and more amateurs than most previous drills. 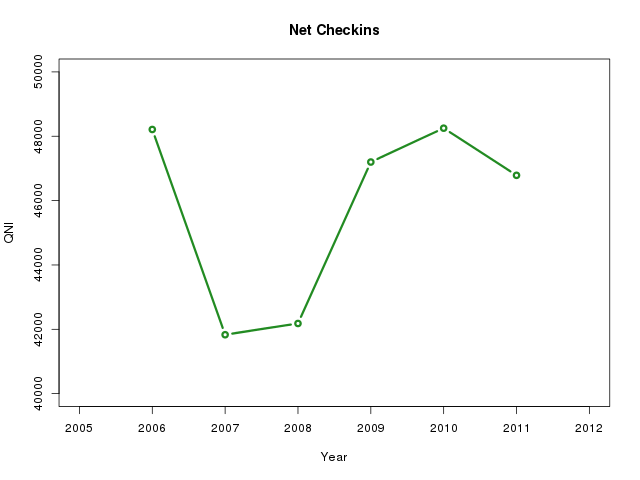 The number of checkins experienced by the nets in the section has remained relatively flat (notice that the entire Y axis only covers a range of about 25%). It is not clear what caused the depression of 2007-2008.